BUFFALO — The Buffalo Sabres will have the best odds to win the NHL Draft Lottery after losing to the Ottawa Senators 4-2 at KeyBank Center on Wednesday. The Sabres (25-43-12) will finish last in the NHL standings for the third time in five seasons. 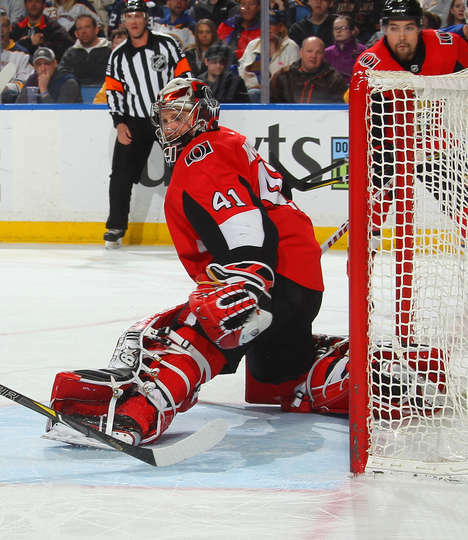 Craig Anderson made 32 saves for the Senators (28-41-11), who are next-to-last in the NHL, two points behind the Montreal Canadiens and Arizona Coyotes with two games remaining. The NHL Draft Lottery will be held April 28. Buffalo will have an 18.5 percent chance to be given the No. 1 pick in the 2018 NHL Draft, which is scheduled for June 22-23. The Sabres did not win the first pick in 2014 or in 2015, the other times they had the best odds. O’Reilly gave the Sabres a 1-0 lead 30 seconds into the first period with a breakaway goal after a pass from Scott Wilson. Max McCormick made it 1-1 at 2:56 when he tipped a shot by Mark Borowiecki. Matt Duchene gave Ottawa a 2-1 lead at 6:10 of the first when his shot from the high slot got through a screen by Colin White. Ryan Dzingel made it 3-1 at 3:21 of the second period from the right face-off circle. Kyle Okposo made it 3-2 at 16:41 of the second period when his shot from the slot got through a screen by Evan Rodrigues. Alexandre Burrows scored an empty-net goal at 19:21 of the third period to make it 4-2. Dzingel’s goal at 3:21 of the second period. Anderson’s save against Brendan Guhle at 9:34 of the second period. Senators forward Bobby Ryan let the game in the first period with a lower-body injury. “Day to day, we’ll see tomorrow,” Boucher said. “It’s not something bad, but it was tender there, so we figured we’d be OK with the guys that are there and hopefully he’ll be back for the next game.” … Borowiecki’s assist was his first point since March 13 (10 games). … O’Reilly (three goals, three assists) and Sam Reinhart (four goals, two assists) each has a four-game point streak. … Karlsson is not expected to play in Ottawa’s final two games, remaining at home to be with his family after his son was stillborn last month. … The team that finishes 30th has a 13.5 percent chance to get the No. 1 pick in the 2018 draft. It decreases to 8.5 percent at 27th.